it's all about the ride! The patented single-beam rear suspension on ALPHA ONE™ always draws a crowd. And that’s before it starts ruthlessly shedding snow to stay lightweight and effortlessly maneuver through any mountain run. 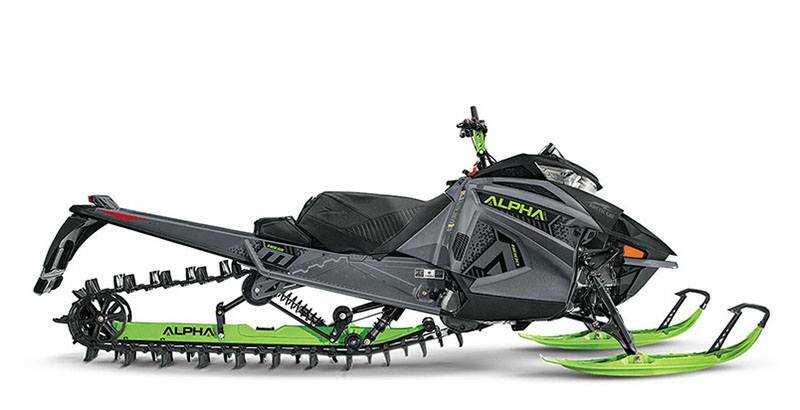 ALPHA ONE SINGLE-BEAM REAR SUSPENSION: Our single-beam rear suspension unlocks more maneuverability than any mountain snowmobile in history. Up here, there's only one alpha. See video link for additional details. ASCENDER FLATFORM: The Ascender platform brings together an arsenal of innovations that deliver the highest level of backcountry performance and handling for every Arctic Cat Mountain Snowmobile. See video link for additional details. ARCTIC CAT IFP GAS SHOCKS: Arctic Cat IFP coil-over shocks are engineered with a hard-anodized 1.5-in. aluminum body; 0.5- in. shaft; aluminum internal floating piston; and high-quality seals and ice scrapers. 8000 SERIES C-TEC2 ENGINE: New for 2020, the next generation 8000 Series C-TEC2 engine delivers a new level of clean Arctic Cat 2-stroke engine performance and technology. This new 794 cc C-TEC2 twin features include new cylinders, pistons, combustion chamber, flywheel and fuel rail; new fuel calibration strategy and Arctic Power Valve system with 3-stage control of the auxiliary exhaust ports via side valves; ECM-controlled electronic oil pump; batteryless EFI; Exhaust Pop Temperature Sensor (EPTS); knock sensor; engine reverse technology. 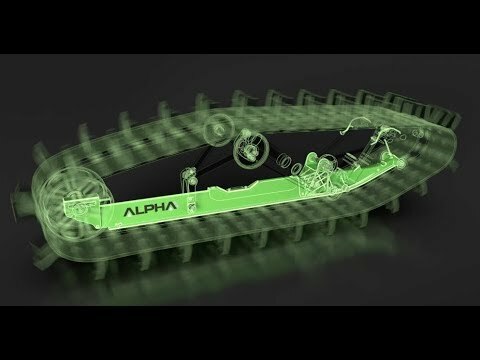 This advanced new technology designed by Arctic Cat and built in St. Cloud, MN delivers ultra-clean, more responsive performance, enhanced power in the 165 hp class of engines, precision oil injection, precision oil injection and exceedingly robust and lightweight design. AMS FRONT SUSPENSION: Arctic Mountain Suspension is tailor-made to maneuver in deep snow. The lightweight, forged-aluminum spindles sit at a 27 degree spindle caster angle, providing optimal ski camber for off-trail cornering and more predictable counter-steering when side-hilling. They’re built to reduce drag, while the dual-phase alloy-steel A-arms are lightweight and durable. 1 IN. MOUNTAIN-HEIGHT WINDSHIELD: Get all the low-profile visibility you need to tear up the mountain. POWER CLAW TRACK: Power Claw Track is built lightweight, with a single-ply design and a 3.0-inch pitch — all so you can master deep snow runs. Its stagger-set, curved-forward paddle towers won't fold over or take a set, and Attack 20 paddles let you float over the deep stuff. ADJUSTABLE 35.5-37.5 IN. SKI STANCE: Easily adjust your ski stance in seconds — keep it wide for the trails or narrow through the trees. System capacity - 5 qt. 165 x 15 x 3 in.